Machinima's highly-popular series How to Annoy People is recently back with Season 3 after about a 2 year hiatus. The weekly episodes show how its creator, Kevin deliberately annoys other gamers who weren't playing seriously, found it funny or those who are really not so friendly. We recently had the chance to interview him on the comeback of Season 3. TSG: Hi Kevin, could you start by sharing with us about yourself? For example how did you first get into gaming and what drove you to upload them on youtube? Kevin: Well, I started gaming when I was a kid but never got into online gaming until 3 or 4 years ago. I started gaming online around the time Call of Duty 4 came out and I managed to get myself an Xbox 360. I got really stuck into Call of Duty for a while, then my friend started posting a few clips of his gameplay online and I thought it would be a bit of fun so off to the store I went, got my first capture card and recorded a very very very average video, it got a few views and a few likes, I'm talking low double digits here. I was delighted. I guess it just snowballed from there really. TSG: We understand that How to Annoy People isn't how you usually play or do, but have you met anyone that you just had to troll them? Kevin: Haha, haven't we all? I think there's always someone you run into that is just making a fool of themselves or picking on someone who isn't retaliating and just thought "I'm going to mess with his head so bad, he will never want to play this game again". I mean it's hard not to troll someone when they are getting angry like that without a rational reason. I would like to say I'm a vigilante giving angry gamers some payback, but that's not true at all, I just find it hilarious. TSG: What is one thing you yourself get most annoyed at? Kevin: People who get angry at other people and give them abuse when they did nothing to deserve it, it just gives all gamers a bad reputation and discourages new people from playing online. It just gets under my skin and it doesn't accomplish anything, if they are on your team they will play worse because of the abuse they are getting and if they are against you, you'll just look like an idiot. I'm all for annoying people that deserve it, but leave people that are just there to play a game alone, that’s my opinion on it. TSG: The last episode/season of How to Annoy People was about 2 years ago, why the break in between and what inspired you to continue the series? Kevin: Honestly by the end of season 2, I needed a break. Season 1 and 2 were very close together and it was too much of the same thing over and over again. I knew I was getting bored and I really wanted it to end on a high note rather than going for another season and letting the name down. I would have came back after a few months to do it but despite trying on numerous occasions, I couldn't. There was always one person in the lobby "It's Kevin! Kevin from How To Annoy! ", I guess the popularity of the series was it's own downfall really. TSG: You mentioned in one of your personal videos that Season 3 is going to be more polished, what else can we expect this time around? Kevin: I'm happy with how the other two seasons were in terms of comedy and stuff but looking back on it, audio and video quality was not up to scratch. The new season is way better in sound and video as well as having an outro graphic linking out to previous episodes. It's not a huge difference but all the little things mean a lot now when it comes to videos. TSG: How to Annoy People has been based on Call of Duty titles, what are your thoughts on, if you tried it in other games you play? For example, Team Fortress 2 or League of Legends, how do you think the community or the mechanics of annoying them could be different? Kevin: I would LOVE to do an episode on League of Legends but it's just text communication and I don't think that would turn out as good. I think the voice chat is a big part of the series and why people seem to like it so much. There's always a possibility of trying different games with voice chat but I'll be staying on Call of Duty for the time being. TSG: What's your biggest worry or do you face any difficulties when filming the episodes? Kevin: Getting recognized by someone, it used to happen quite a lot. It's why there was such a break from season 2 to 3 but now it doesn't happen as often. It's just that my series works off me being some random new guy and it doesn't work out so good if someone starts shouting, "It's Kevin! From How to Annoy on YouTube!". A lot of times, It's not meant to hinder my recording, it's just someone getting happy which is great, it can just be a bit of trouble when I'm trying to get a new episode made and everyone in the lobby is alerted to what I'm doing and I have to leave. TSG: Lastly, do you have anything else to say to your fans? Kevin: I'd just like to thank everyone for watching the series and giving me such excellent feedback, I'm not lying when I say it really makes my day. I'm very privileged to have the opportunity to make content on YouTube and I won't forget how lucky I am to have people support my videos. 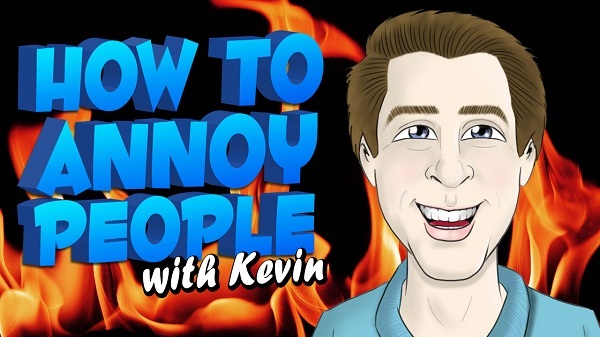 If you're a long-time fan of Kevin and his How to Annoy episodes, or even if you're new to his series, you will be glad to hear that Season 3 has recently premiered on Machinima Respawn and following episodes will continue to be published every Sunday (US time). Note: A huge thank you to Kevin for taking the time on this interview and the folks at Machinima for the opportunity.